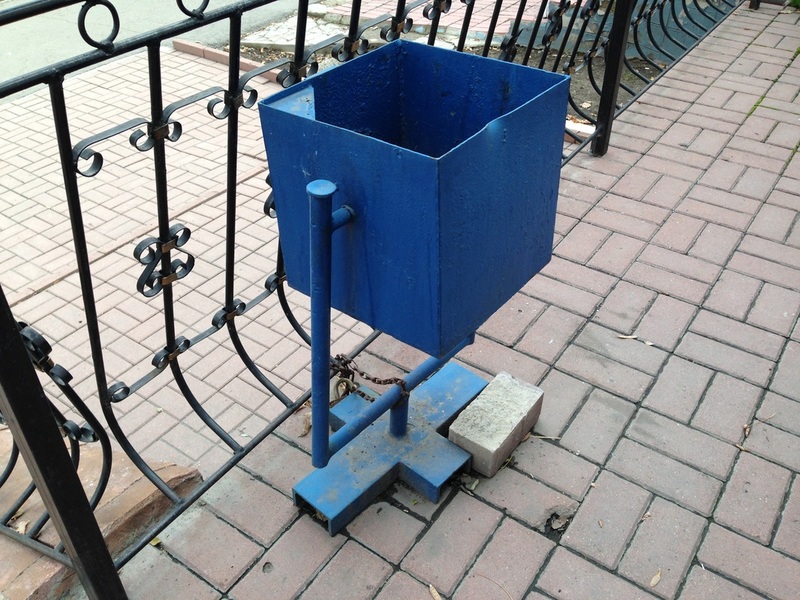 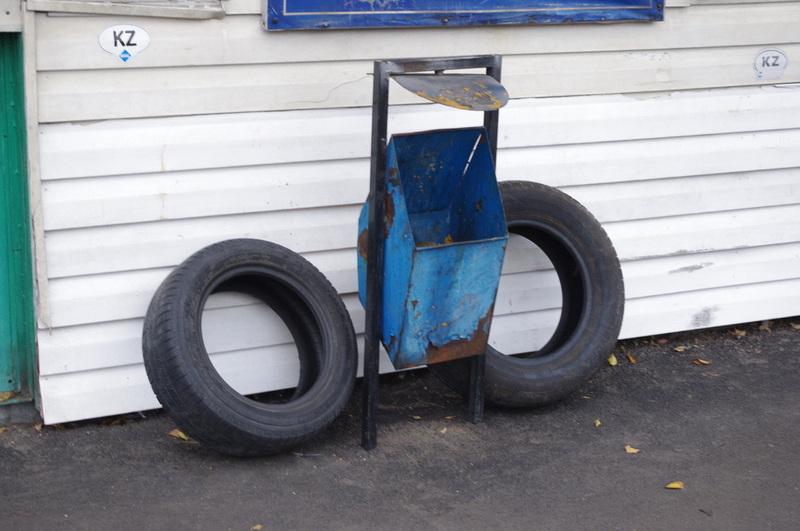 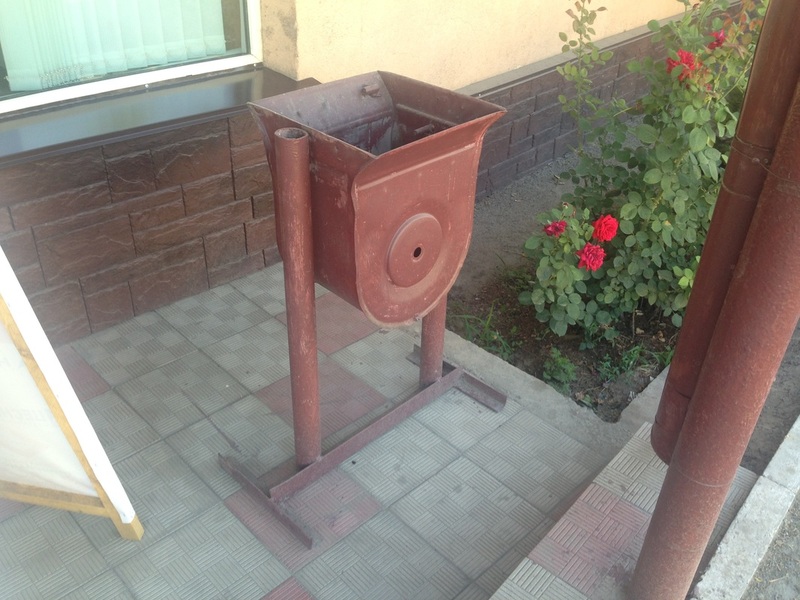 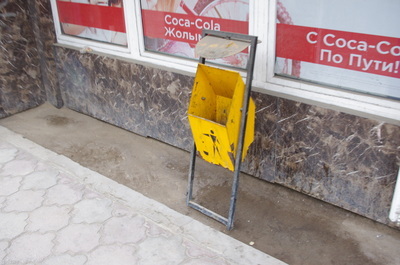 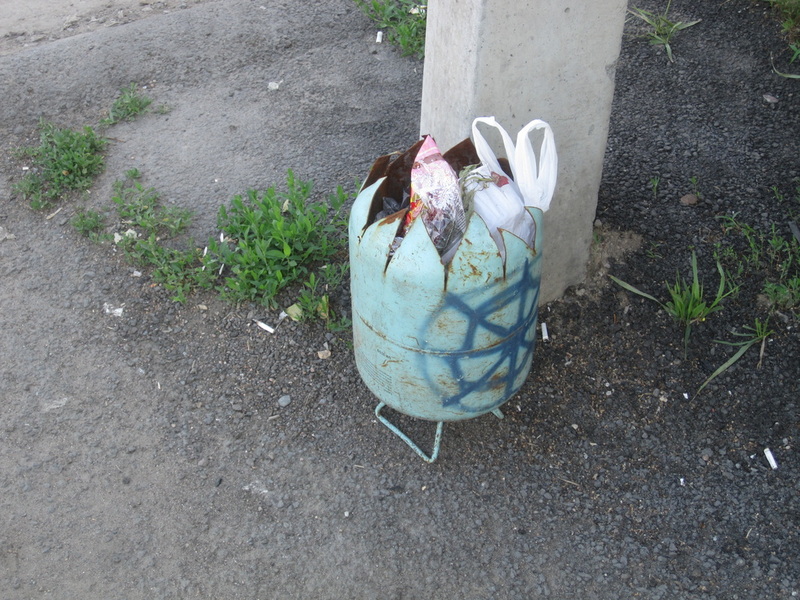 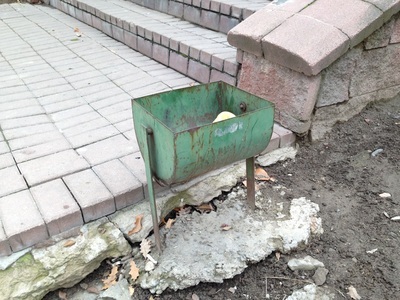 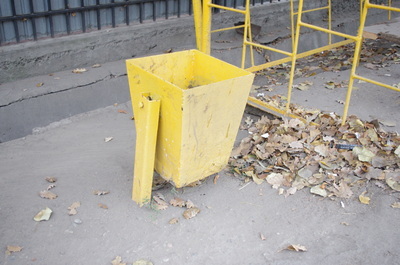 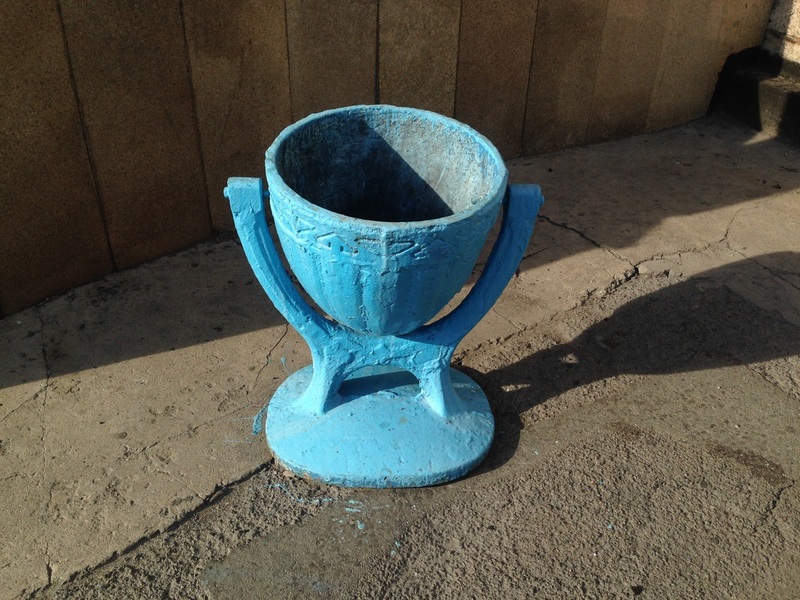 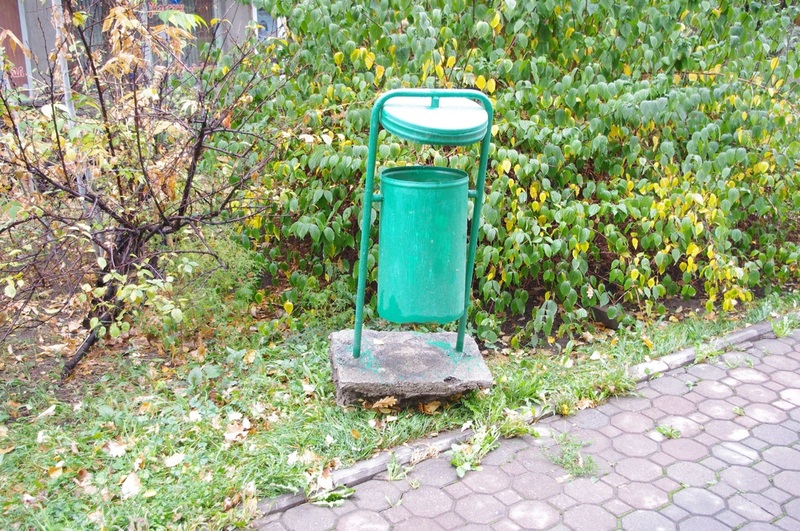 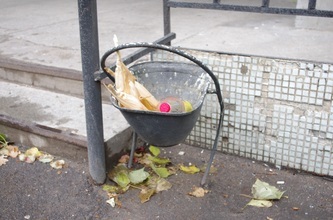 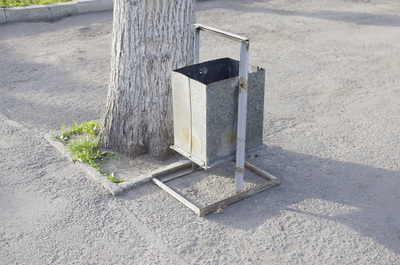 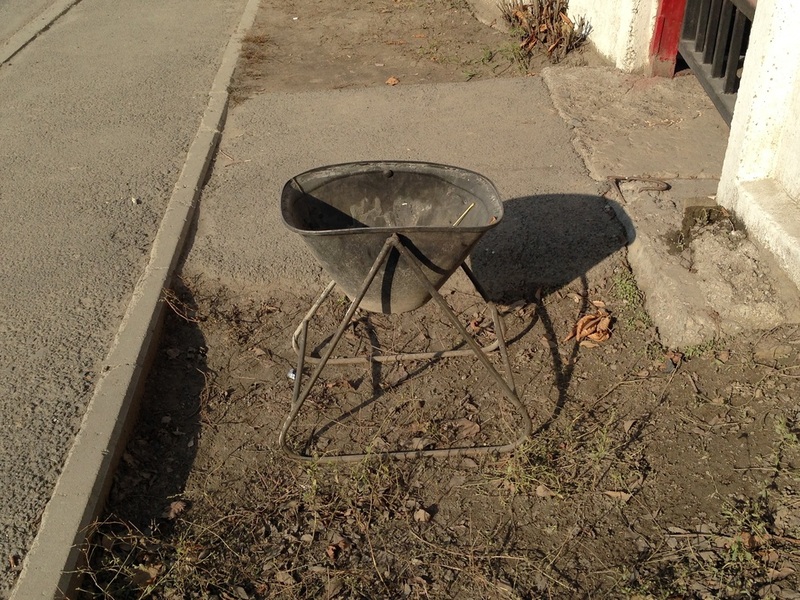 The Almaty trash can is a quirky thing: a bin that spins with a roof on top. 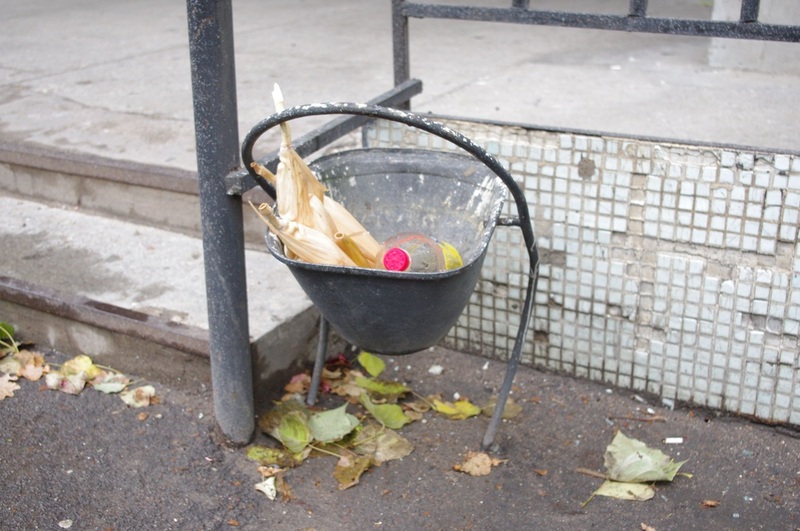 But it's funny that, in a city full of swinging trash cans, I've never seen one swung. 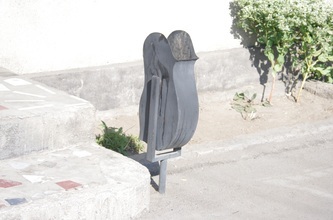 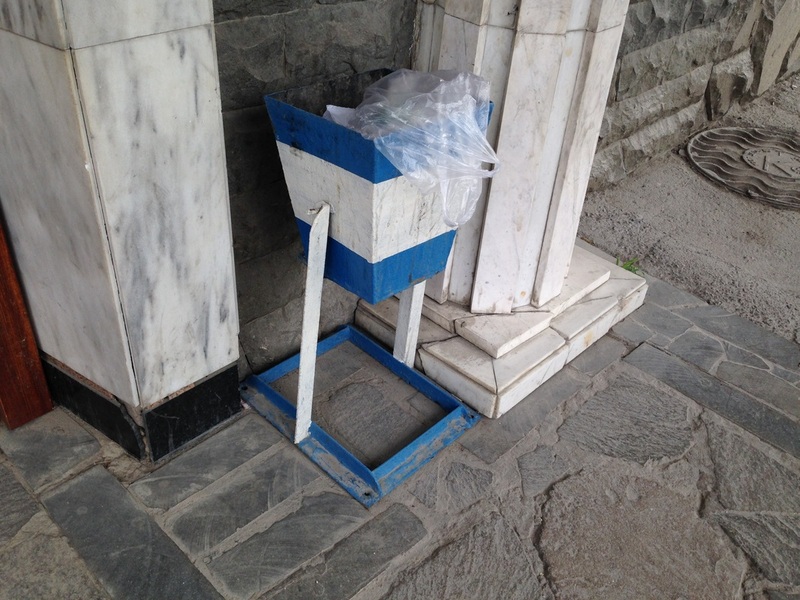 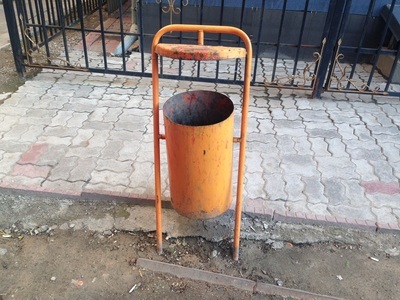 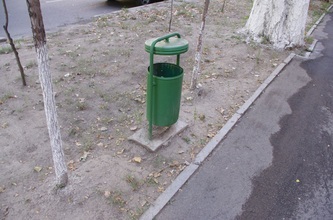 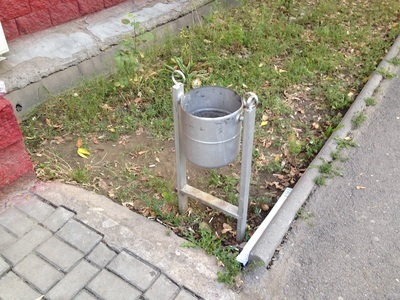 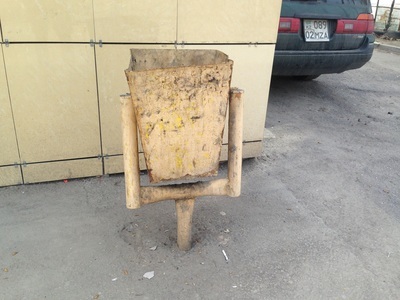 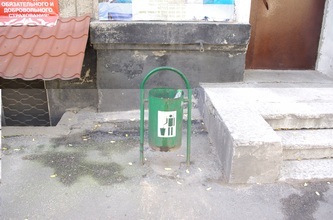 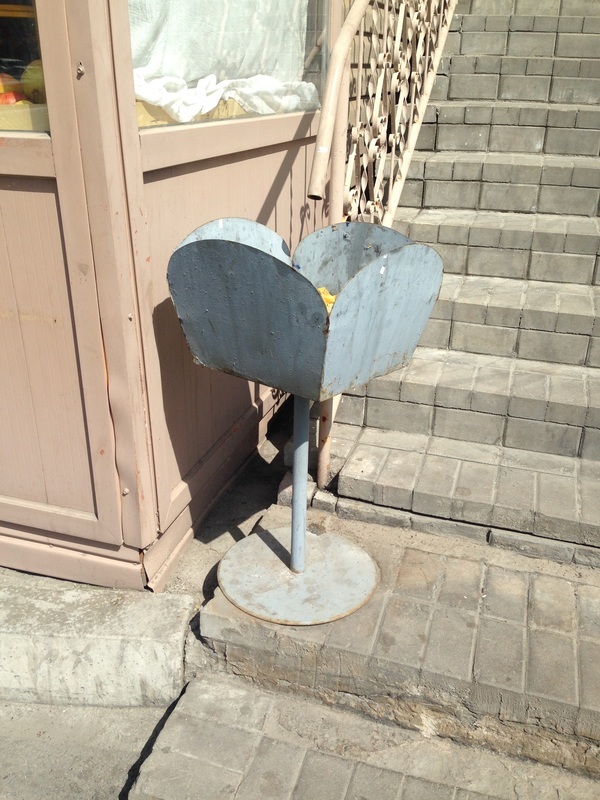 The public waste receptacles in Almaty have been given hinges, I presume, to make them easier to empty. 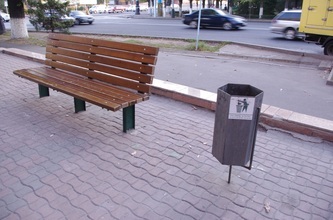 Is it really such an advantage? Allow me some unproven speculation: the rotating trash bin was the child of a plasticless era, before garbage bags, when the alternative was the humble metal bucket, ever so easy to steal. 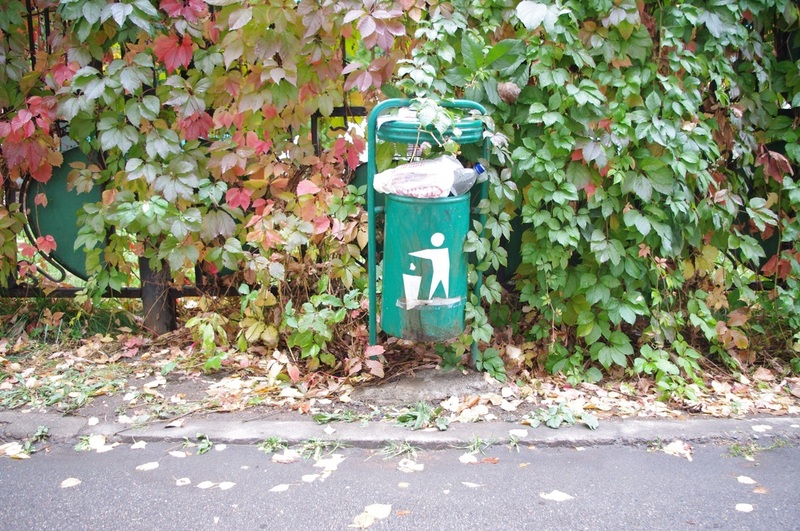 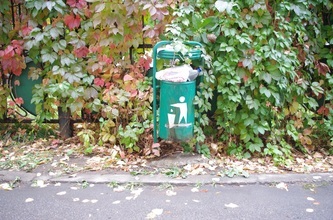 A rotating garbage bin could be anchored to the ground, impervious to thieves, yet the trash man could still use gravity to help spill out its contents. 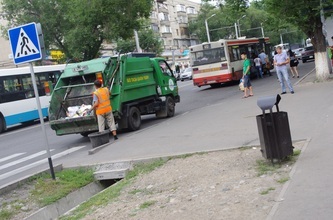 Almaty's modern-day garbage collectors, wearing their plastic workers' vests, surely understand how this works. 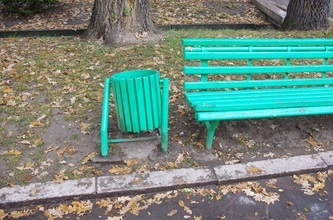 The design innovation, however, is left unused. 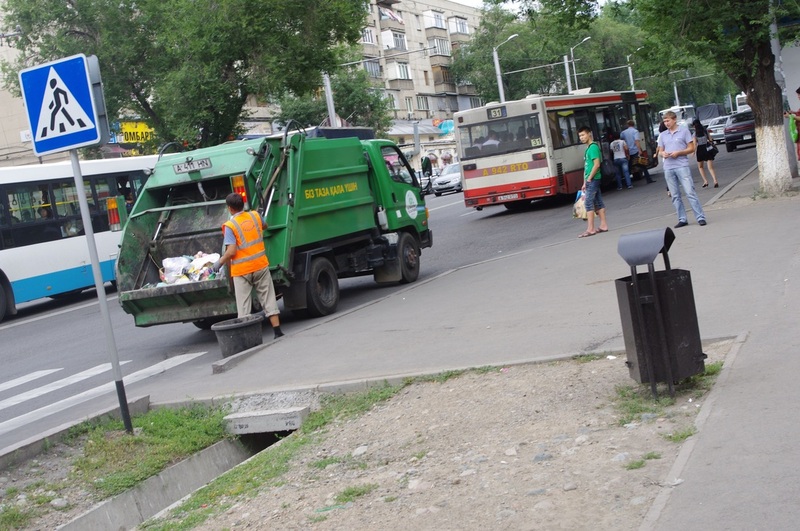 Municipal workers pluck out the trash with their hands, or with a handy grabber. It must be the trash juice pooled at the bottom that frightens them. 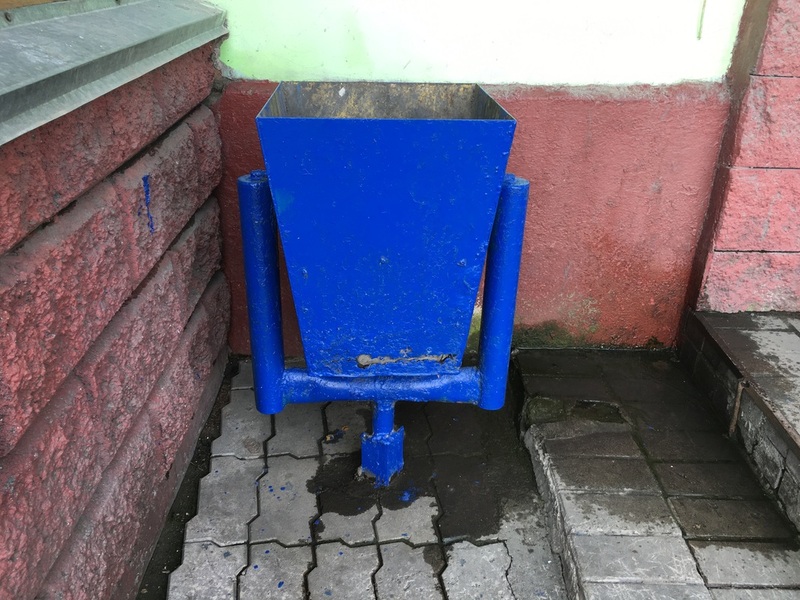 There are usually no bags in these bins, and nobody likes trash juice. 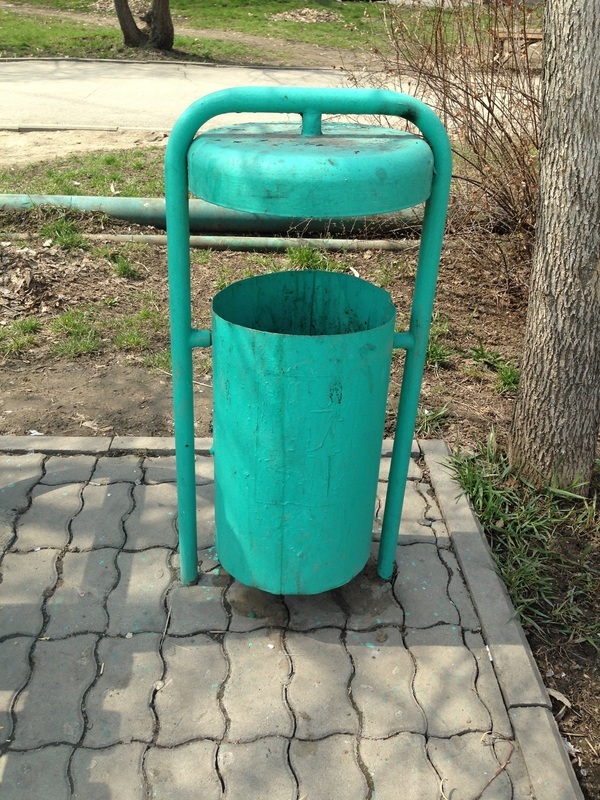 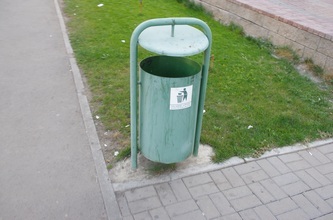 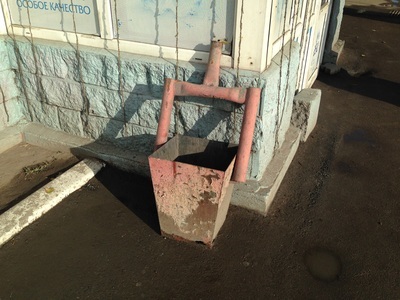 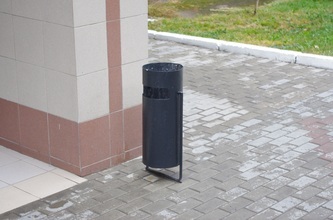 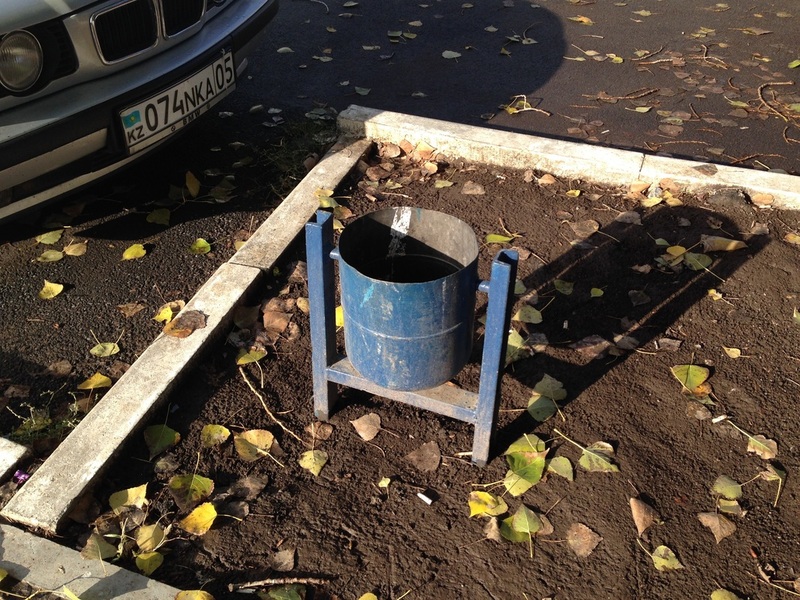 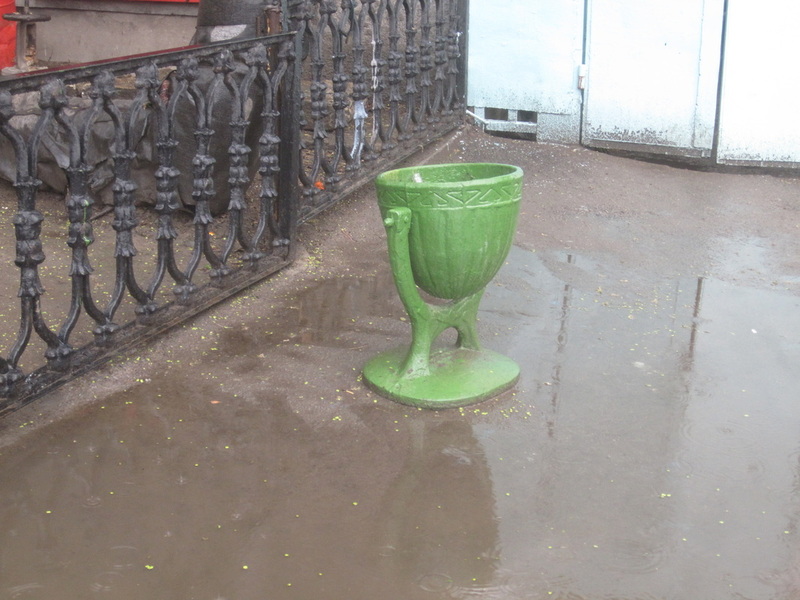 It's interesting that in Russian, the outdoor trash can has an entirely different name than the one inside. 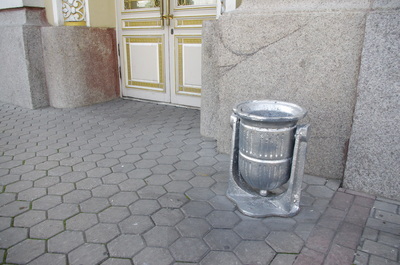 Under the kitchen sink, it's just a musorka [мусорка], from the word musor, for "trash", but in the park it's an urna [урна], sounding decidedly more dignified, to my ear at least. If the word urna looks familiar, that's because it's also used to describe an urn for ashes [погребальная урна; pogrebalnaya urna]. 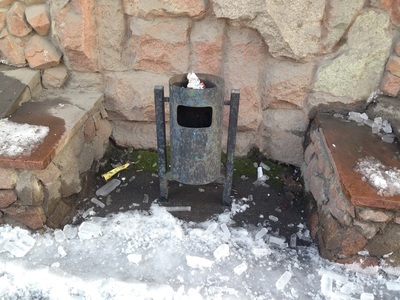 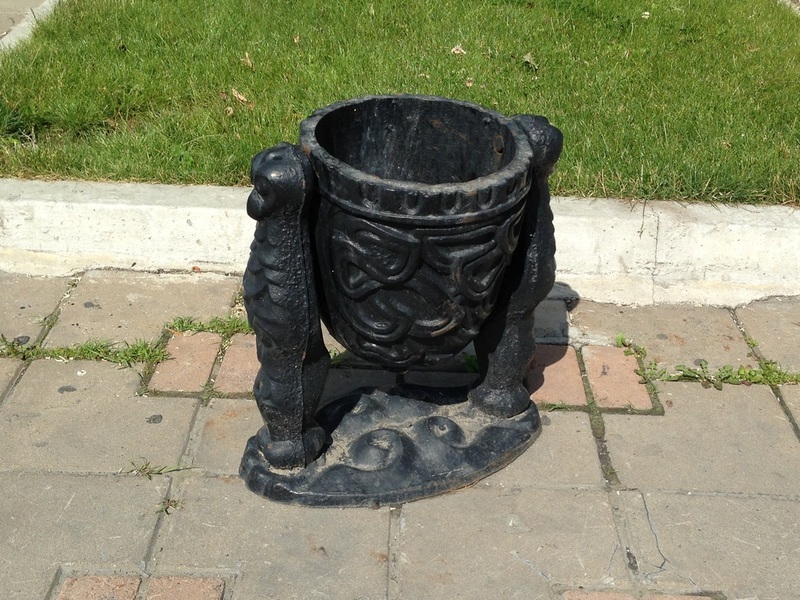 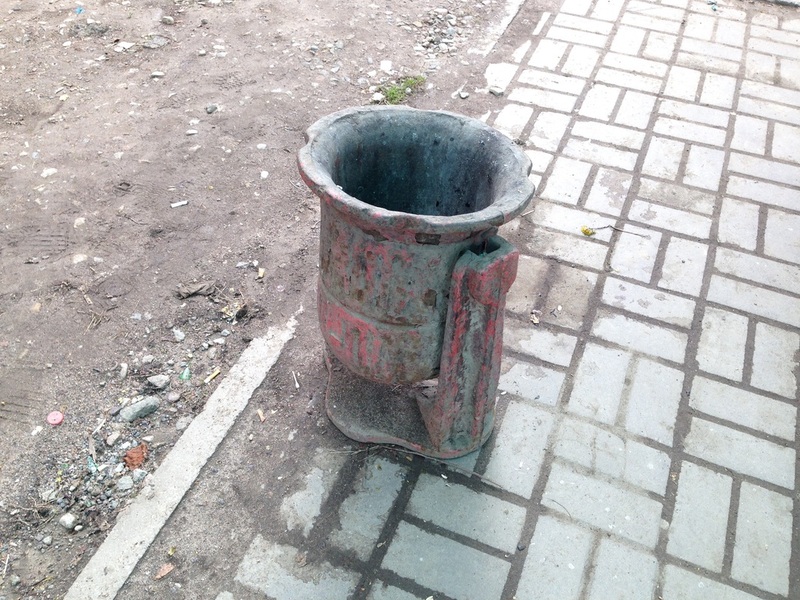 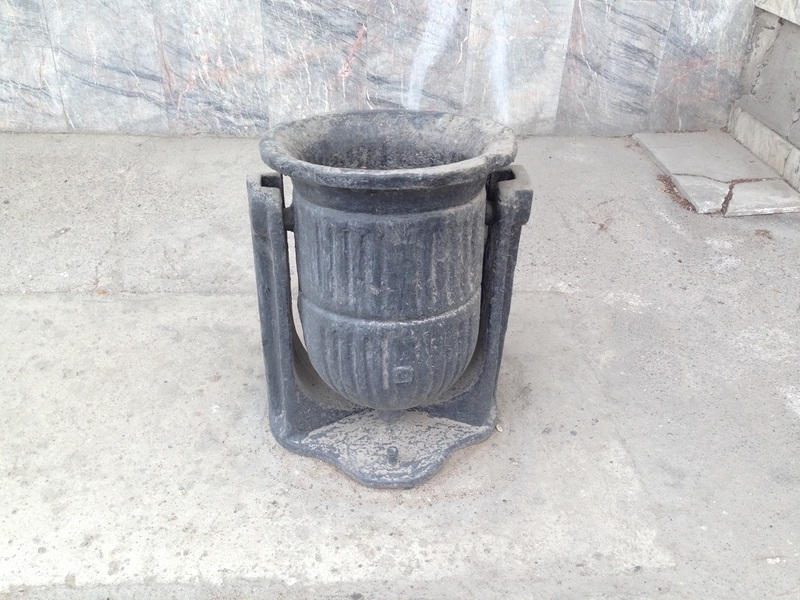 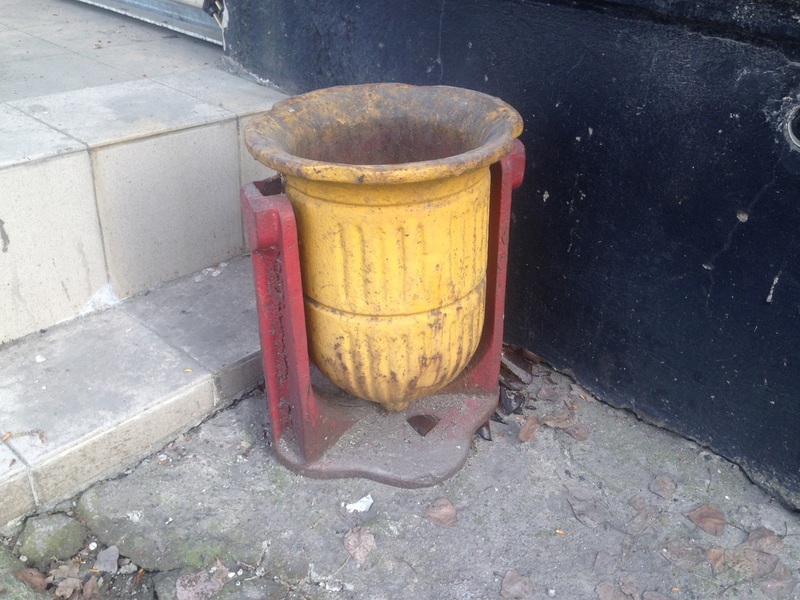 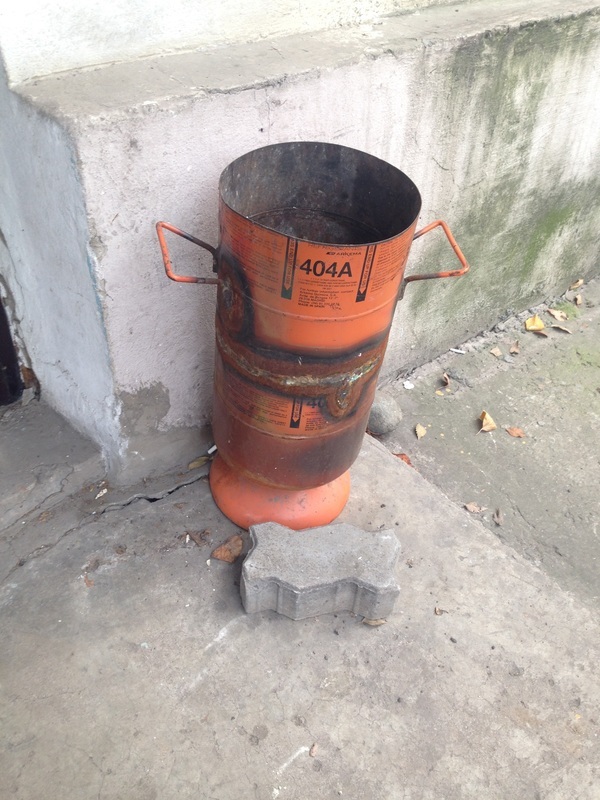 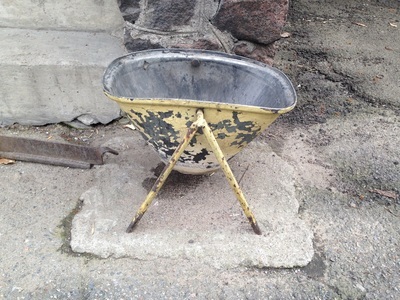 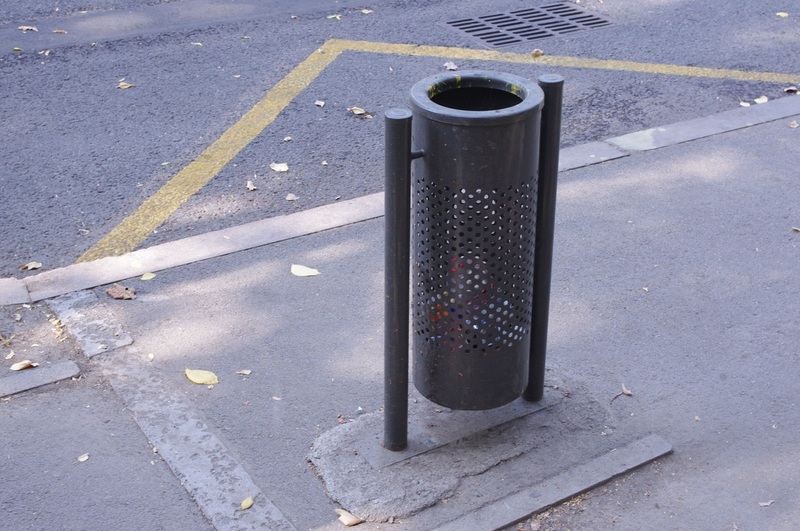 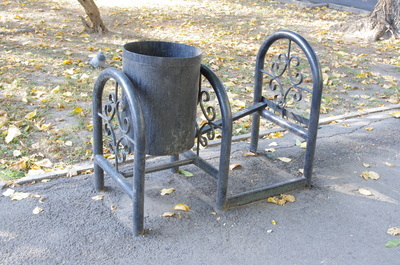 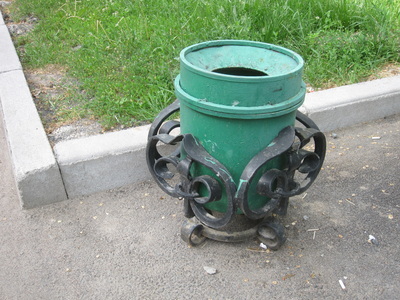 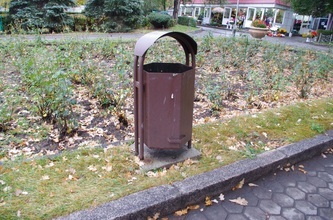 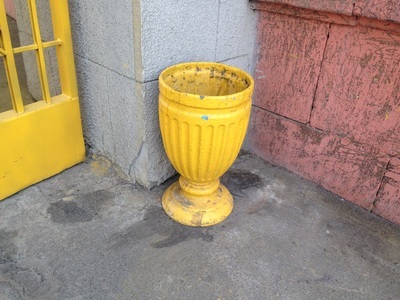 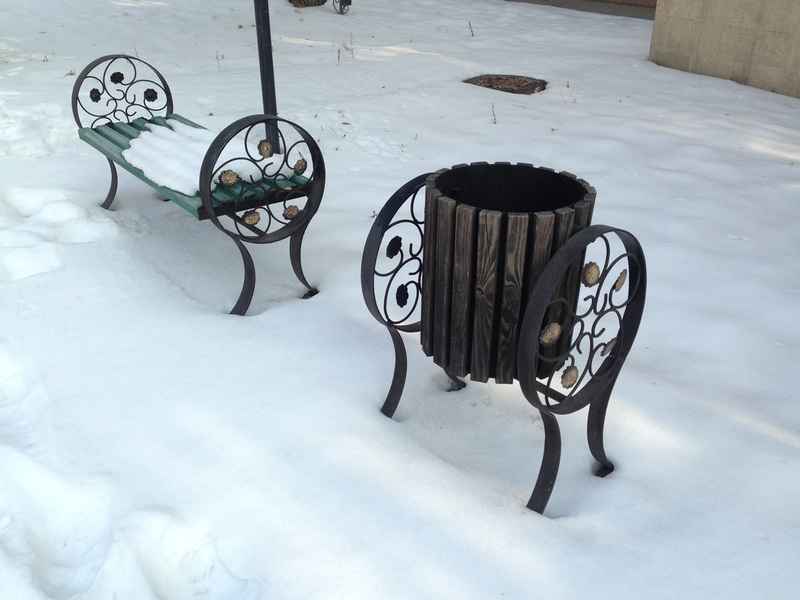 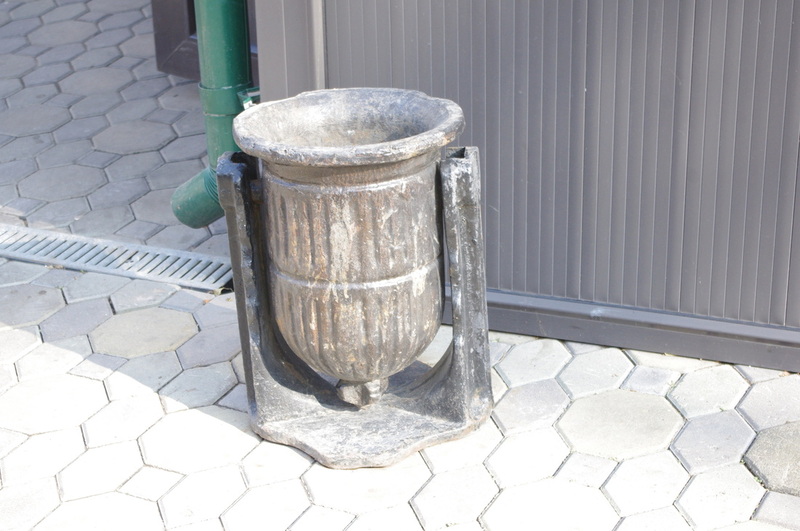 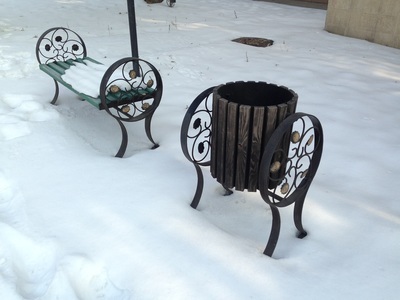 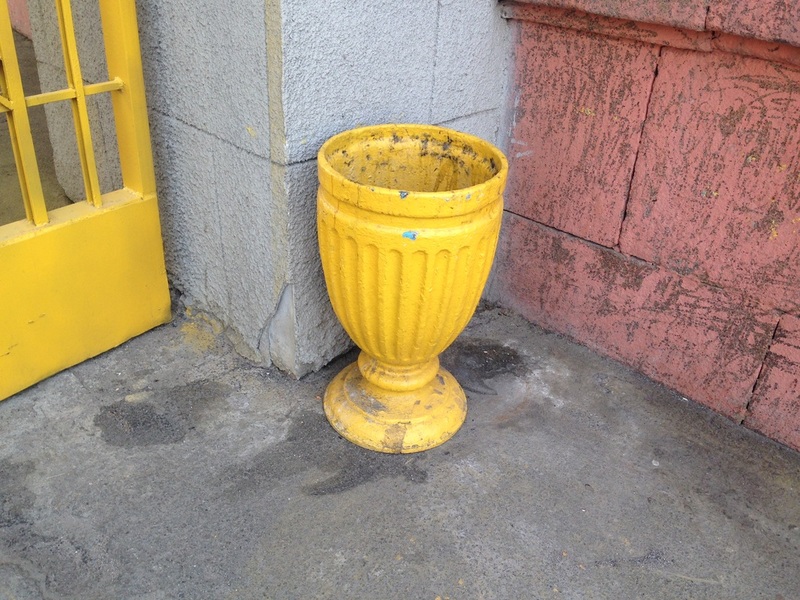 I especially like Soviet-era urnas, made of thick iron and about as classy as a trash can gets. Maybe having its own name gives the outdoor trash can some sense of purpose. It's lent a certain gravitas. 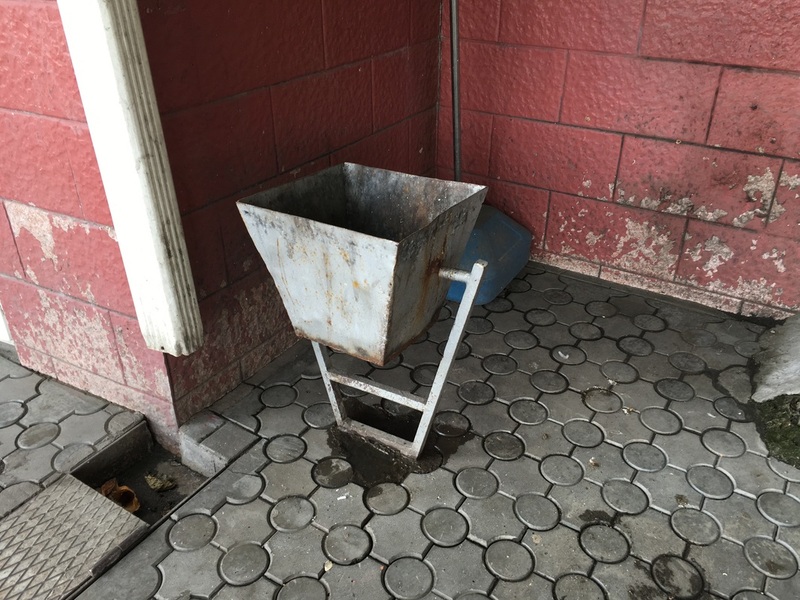 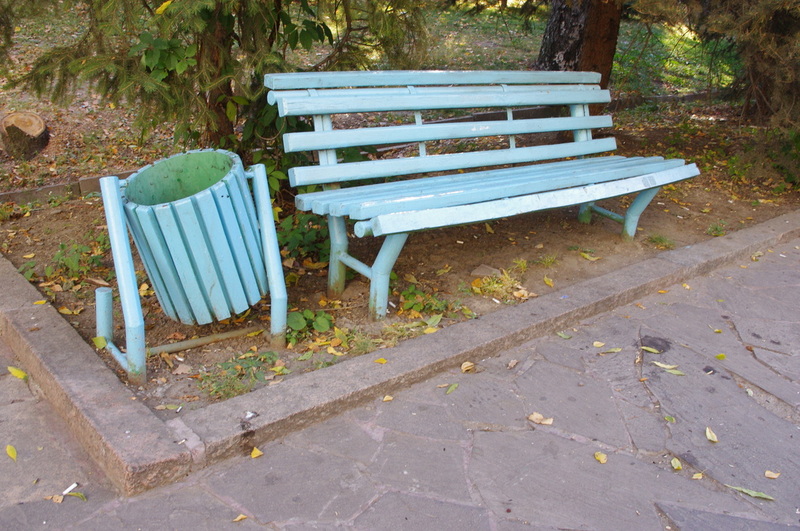 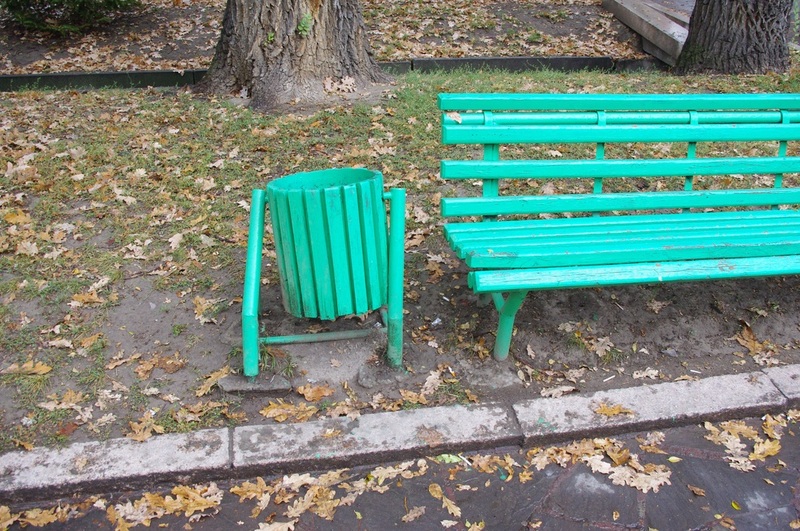 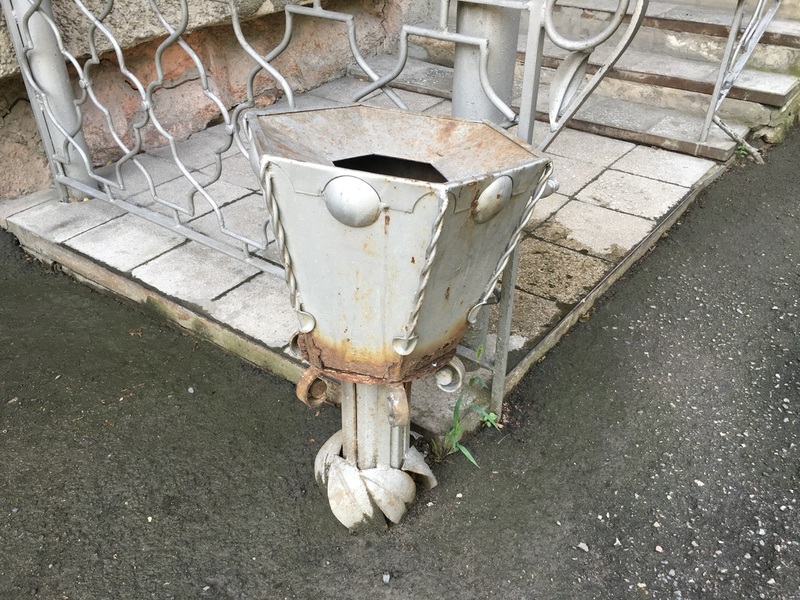 My main hobby is exploring and documenting things that are hilariously uninteresting, so I was delighted to find that at least a couple of Russian designers had been similarly obsessed with the inadequacies of local trash technology. 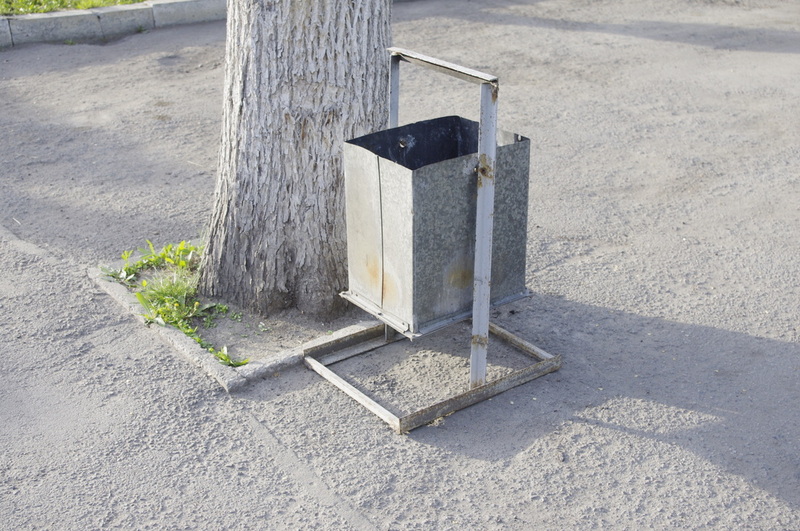 One, Artyomy Lebedev, even drew up a full diagram illustrating the different trash can potentials, nothing that the little roofs [крышки; kryshki] are quite useful, as are bags (hear that, city hall? 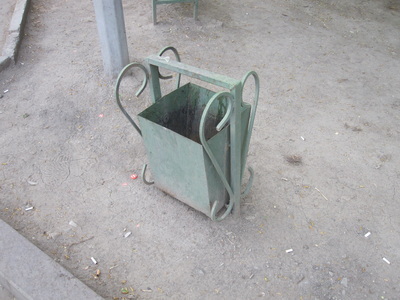 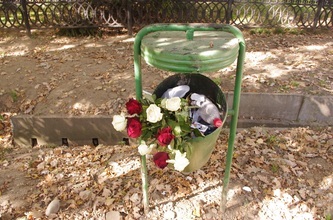 ), but that the swinging trash can [переворачивающаяся урна; perevorachivayushayasya urna] should be retired. 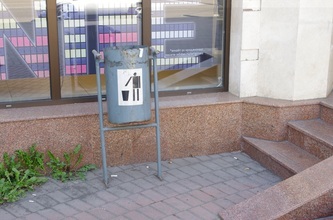 His optimal trash can, seen in the middle of the illustration, hereby receives my endorsement for Almaty's next trash can contract. 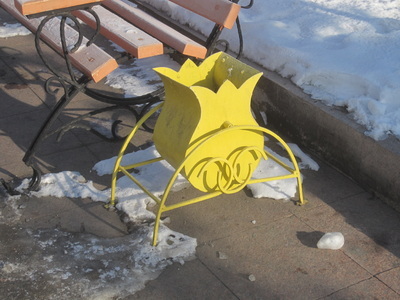 Go get 'em, Artyomy.